There are a lot of free things being offered on Father's Day (that's today, mind you). However, many of them come with a price. That means you have to buy something to get something. That's not really free, right? 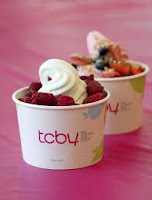 TCBY is not conforming to that notion... they are offering a FREE 6 oz. yogurt for the lug today. That again doesn't seem like much, but it's free. I just thought you should know since that's the point of me doing this site! Just go to your local TCBY and tell them you're a dad and get a yogurt. Click here to view the quick blurb on it via the TCBY website.